This morning, while we were super excited to go outside and enjoy the 80 degree weather, it started to get dark. So we headed in to instead find something more crafty and and kids play. Now recently two things happened. 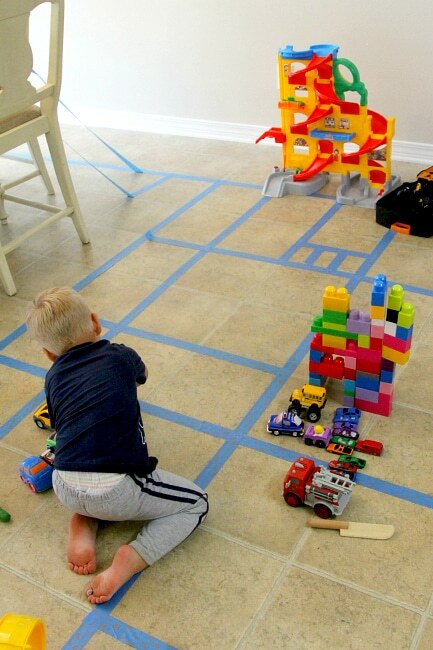 One, a pitch came to my email advertising a sort of play kids car tape where you can set up roads and two, a picture has been circulating the internet on the same deal but using masking tape. And both prompted me to consider the unused blue painting tape that has been sitting in my garage as a haven for a spider webs for atleast a year, so being the mom I am, I dug it out and got to work. While it’s not fancy store bought tape with lines down the middle and it’s not white masking tape so you can draw your own, my painters tape is easy to lay down and just as easy to pull up. The whole thing took less than 5 minutes but has provided hours of fun!! Our makeshift interstate was also really good at keeping Phoenyx busy on and off all day and even better, any time he looked like he was running out of steam I “built” a new section of road to peak his interest again. 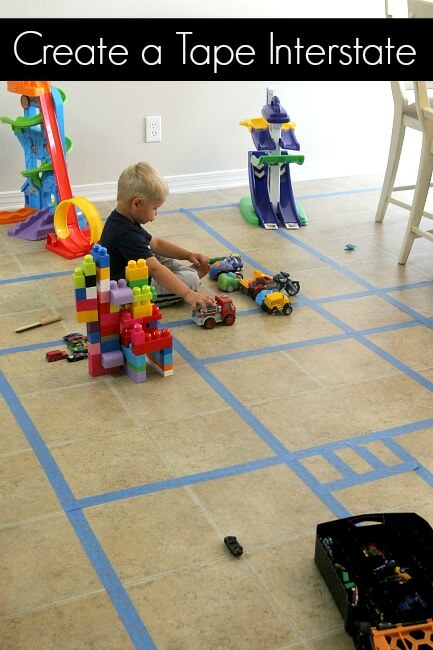 Start building your “road” on any type of flooring, up the walls, across the couches and more! 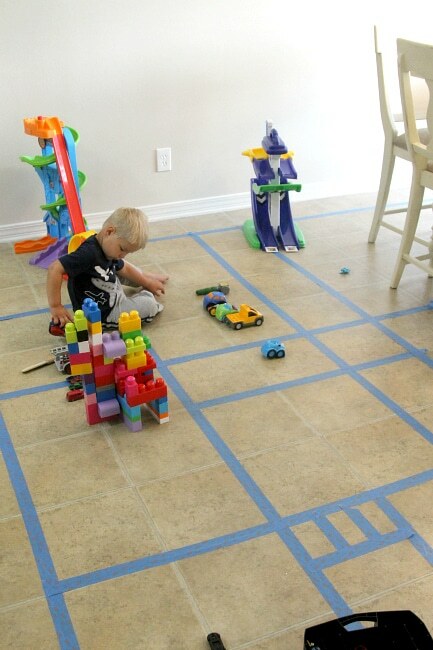 For some added fun we took out some blocks and built some cities and I included some parking lot areas. The beauty is this works in all parts of your home, down the stairs, across the dining room table and out the front door! 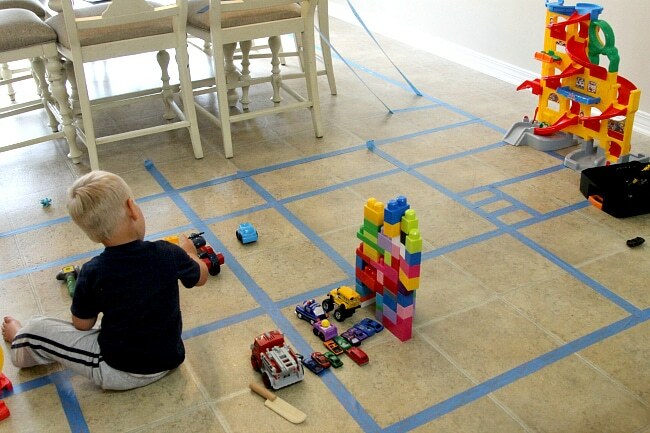 I did something similar in our basement for the kids but I left it there for a while because they loved it so much! Seriously genius and simple idea!! Love it! That looks like he enjoyed himself! Adorable!! Great and resourceful idea! Looks like your little guy had a blast and that is the main thing. Now he can create a new one everyday… and painters tape doesn’t cost an arm and a leg like something customized. Very cute idea Trisha! He sure looks like he’s having fun. This is an awesome idea! Jaden would absolutely love this with all his trucks and cars. And we’re due for some rainy days this week. I may just have to dig out the painter’s tape. What a great rainy day activity for the little ones! It’s so much better than “non” roads to drive on through the house. Magnificent! My grandkids will LOVE this! 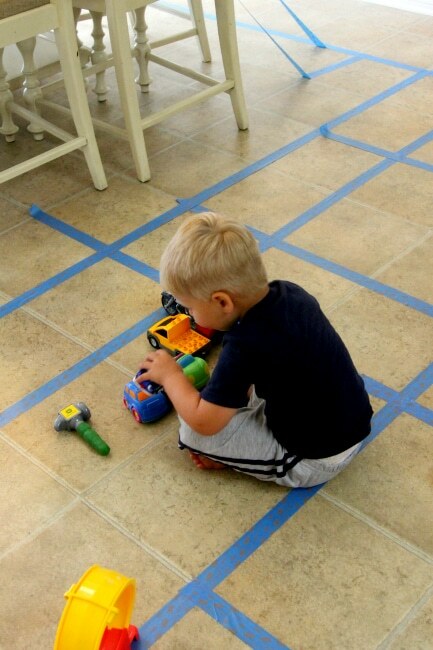 My youngest daughter has wood floors through out her house, and it will make it tons easier and loads of fun for them! Super cute. Much better than the road map rugs!!! This would be fun to do with my kids. My son seriously has about 300 matchbox and hot wheels cars. My daughter is P’s age and is always right there with playing cars with her big brother.